First Sega Toys girls-only portable audio player, now this: The PowerShot E1, a new digital camera from Canon [JP], specifically made for women. The company has presented a few new cameras in the last days but this model is unique in its own way: Canon says it used relaxation, positive feelings and friendliness as the main guidelines for the design of the camera. 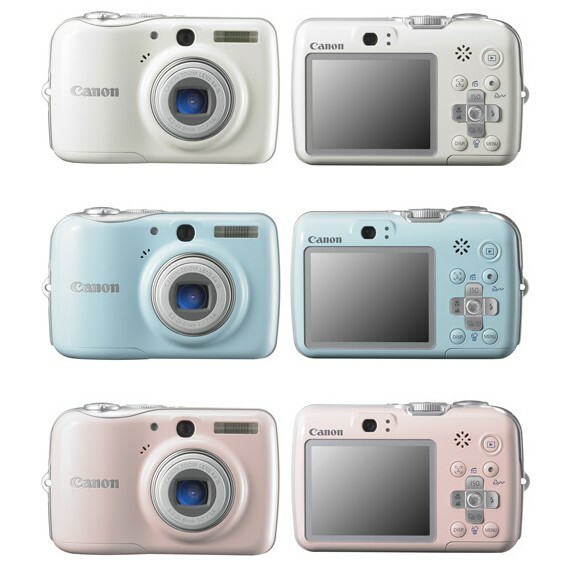 The PowerShot E1 comes in three different “extra-friendly” colors (vanilla white, aqua blue, cotton pink) and features a soft, round, light and compact body (160g), supposedly to fit the hands of Japanese women (by whom the camera was designed). Canon also says they paid attention to make it as easy to use as possible, i. e. by leaving out “unnecessary buttons”. The PowerShot E1 will cost $215 in Japan where it’s supposed to be available at the beginning of September.